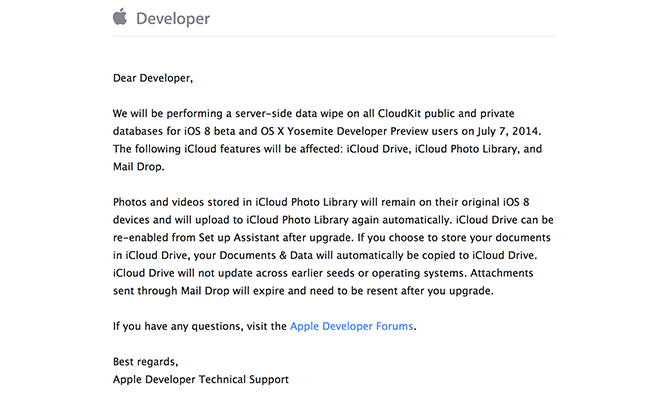 Apple on Friday sent out letters to developers testing the iOS 8 beta and OS X 10.10 Yosemite Preview, notifying them of an upcoming server-side wipe of all CloudKit databases scheduled for July 7. According to the letter, provided by AppleInsider reader Gregg, Apple will be wiping both public and private iCloud data connected to the current iOS 8 and Yosemite beta builds, with features affected including iCloud Drive, iCloud Photo Library and Mail Drop attachments. As noted by Apple, photos and videos stored in the new iCloud Photo Library feature will be wiped from the servers, but data will remain on iOS 8 devices. After the process is complete, content is will be automatically uploaded back to Photo Library. With iCloud Drive documents, developers must manually re-enable the feature from Apple's Setup Assistant, though document stored in the cloud service will again be automatically uploaded once services are restored. Finally, email attachments sent through the forthcoming Mail Drop feature will expire, meaning users will need to resend those messages. With Mail Drop, Apple bypasses the usual email attachment data limit by uploading files up to 5GB in size to iCloud and including a link to download within the message's text. When Apple launches its upcoming mobile and desktop operating systems this fall, both will come with deeply integrated iCloud features like Dropbox-style storage in iCloud Drive and beefed-up content sharing services like iCloud Photo Library. AppleInsider recently took a deep dive into iCloudKit as it applies to Apple's future Photos for OS X app and the next-generation of iOS 8 Photos.